A dragon boat team is pictured during the 2016 Chautauqua Lake Dragon Boat race. Entries for the 2017 race are being accepted now. 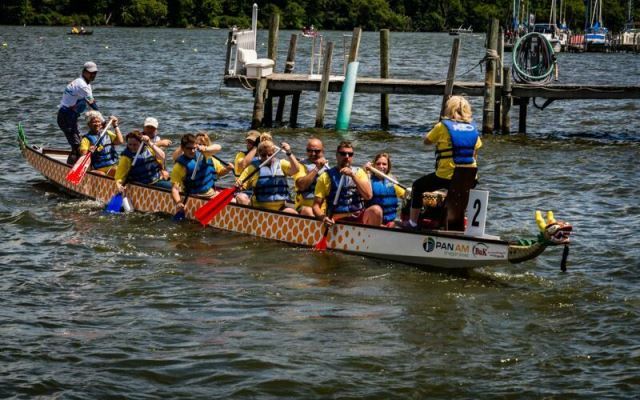 The Chautauqua Lake Dragon Boat Race scheduled for Aug. 12 is offering an early bird entry fee for teams and individuals that register before June 15. Originating in Southern China more than 2,000 years ago, dragon boat racing is a fast-growing team water sport. The inaugural CHQ Dragon Boat Race held in 2016 saw more than 20 boats racing, including teams from local sponsors, community groups and several experienced clubs. The race continues to be the only event of its kind held in the surrounding area. To participate individuals do not require prior experience as training and all of the necessary equipment, including the boat, paddles and lifejackets will be provided. A full team is comprised of 10 paddlers and a drummer in the bow of the boat to keep the paddlers in synch, a steersperson will be provided to stand in the stern and guide the boat. Early bird entry fees are $40 per person or $400 per boat (10 team members, no fee for the drummer). Regular fees after June 15 are $50 per person and $500 per boat. Registration forms are available online www.chqdragonrace.org or for more information contact Shirley Sanfilippo, Planning Committee member, at clerk@celoronny.org.